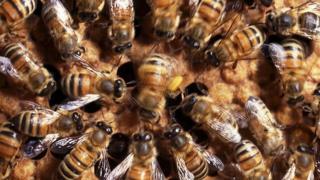 A large number of bees were killed and more than two dozen hives were destroyed by fire in separate attacks. A farm in the village of Sellindge in Kent found 26 hives had been burnt out and others stolen. It is an attack thought to be linked to the theft of two hives from another farm nearby. PC Daniel Mills from Kent Police said: "This damage is not only cruel but detrimental to the beekeepers who will suffer a financial loss." A large number of bees were killed in the attacks, a police spokesman said. The fires and thefts occurred between 11 and 14 June, police said. Police have advised beekeepers to camouflage the hives behind hedges or tall fences or to paint them a muted colour. They also suggested apiarists keep their hives out of view from main roads.